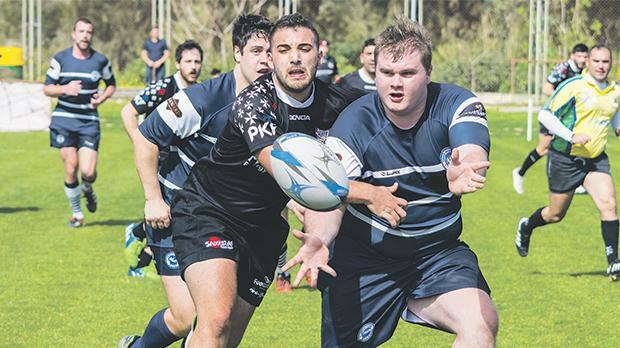 This Cisk Lager League match at the Marsa rugby ground took more than expected to get going… until the ‘angel’ intervened. In fact, Angel Sarres then stole the limelight when taking the game by the scruff of the neck, scoring four tries to dash Kavallieri’s hopes. Kavallieri kicked off with the wind behind them and went on the attack with some good counter rucking. They won a penalty which Darren Edmunds kicked from 40m out to put them into a 3-0 lead. Overseas were having trouble. Their game just wasn’t flowing with dropped passes, wrong options and individual players trying to do too much. But then, from a poor clearing kick by Kavallieri, Overseas launched a long range attack, sweeping right then left to put Rhys Barry in for a try to make it 5-3. At the other end, Edmunds sliced a ball through but it hit the posts and was reclaimed by Overseas. Barry forced his way through, Roderick Borg gathered and offloaded to Jamie Murray and he went to ground. The ball swung right to Sarres who powered his way over. Briffa converted. Overseas won a tight head in the scrum, Christian Briffa stepped, then offloaded to Sarres who scored again for Briffa to clinch the extra points – 19-3. Just before half-time, Dalton was yellow carded for holding back Sarres as he chased a through ball. The second half started with a flourish for Overseas. They scored two quick tries, first by Harvey from a rolling maul from a lineout, then Sarres after Cassar and Stoker had bashed their way over the gain line. With one of the tries converted the score had shot out to 31-3. Referee Lionel Da Silva had to be tended to for an ankle injury but the match official soldiered on, showing true grit. A messy period of play by Overseas, with the ball bobbling about and passes going behind the intended players, was tidied up by Sarres who stepped through the onrushing Kavallieri defence to score his fourth try. It was then Briffa’s turn to show his skill as he dummied and sidestepped on a diagonal run to score before Harvey barged his way to the line to make it 50-3. Kavallieri player/coach Dan Moore, who had replaced the injured Edmunds, came to the fore when using the boot to gain territory. Then his kick fell behind the Overseas backs and perfect for Dalton to score the last try of the match. Nick Horne converted to make the final scoreline more respectable for the losers. Men of the match: Overseas – Angel Sarres; Kavallieri – Mattia Dante. Other league result: Stompers vs Falcons 58-20.